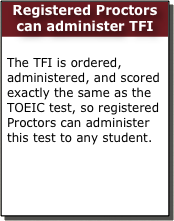 The TFI Test is a parallel test for assessing French Language competencies. If you are studying French and would like to receive an International assessment of your ability with the French language, contact us. See the TFI Examinee Handbook.